Now in its 12th edition, Festival Mediterranea, with the support of Bank of Valletta, will be presenting Giuseppe Verdi's opera "Otello" as the highlight of this Gozitan cultural collaboration. Michael Formosa explained that the Festival is borne by two primary goals - fostering deeper appreciation of local culture amongst those residing in Malta and Gozo, whilst serving as an added attraction to the cultural tourist. Year after year, apart from generating substantial internal tourism, the festival is increasingly appealing to foreign visitors who are specifically coming over for the festival events.” He went on to explain that the Opera at Teatru Astra has established itself as a definite highlight in the Maltese cultural calendar. This year’s Otello is geared to repeat the resounding success of 2012’s Madama Butterfly. He concluded that Teatru Astra and all the cultural activities that it animates are a monument to the reality of voluntary work. This year’s programme of events has several concerts lined up ranging from chamber to symphonic, a dance show, as well as lectures and on-site visits, covering the period of Knights’ of St John’s and celebrating Mattia Preti’s masterpieces on the island. The festival also gives prominence to local traditions and trades especially those related to food and winery. An added attraction this year is visiting ‘Il-Hagar’ a state-of-the-art European funded museum as part of the complex of St George’s Basilica. The Annual Grand Concert of the resident La Stella Philharmonic Band will conclude the twelfth edition of Festival Mediterranea. Prof Joseph Vella highlighted that Otello features among Verdi's more mature operas. He explained that it is remarkable how Verdi managed to bring out the fine psychological nuances of the plot, not only in the singing parts of the main roles, but also in the orchestra. As regards to the latter, with his liberal use of recurrent themes, the treatment is truly symphonic especially in the last Act. He went on to stress the importance of getting world-class soloists to tackle the main parts and establishing ever higher standards. The chorus is the back-bone of Teatru Astra’s production. As has happened over the last 16 years, the Theatre Management has brought over a group of Italian singers, mainly from the famed Teatro dell’Opera, Rome, to add to the texture of the choral sound. This is a practice which has been taken up by other theatres, placing Teatru Astra at the forefront of innovation and progress in the world of opera. The role of Otello will be taken up by by one of the leading Otello stars Badri Maisuradze ago will be sung by Italian Baritone Alessandro Paliaga, whilst local star Miriam Cauchi will interpret the role of Desdemona. Franco de Grandis will interpret the role of Lodovico, Olga Sliepnova will be Emilia and Cliff Zammit Stevens will be singing Cassio. The Malta Philharmonic Orchestra (leader: Marcelline Agius) will feature in the double representation of the opera and the artistic direction is once again being entrusted to Enrico Stinchelli, of Barcaccia fame. A spectacular and aural treat is in store. 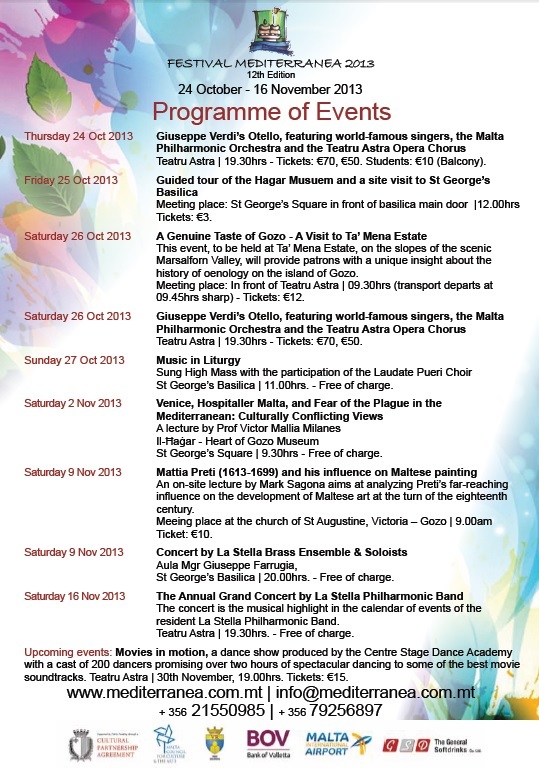 Teatru Astra is also supported by Public Funding through a Cultural Partnership Agreement with the Government of Malta. 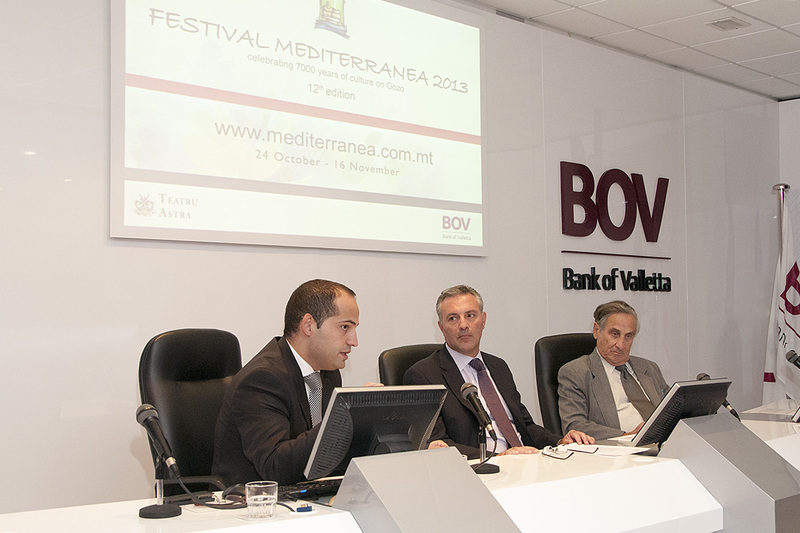 Other partners include Citadel Insurance, Malta International Airport, General Softdrinks and the Victoria Local Council.